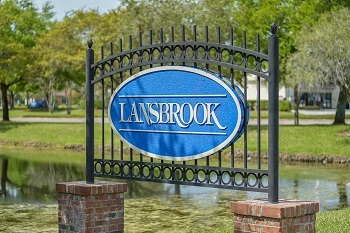 Lansbrook is a remarkable deed restricted community perfectly situated amidst the popular East Lake area of highly desirable Palm Harbor. Gracing the entrance of Lansbrook are magnificent lighted fountains surrounded by lush landscaping welcoming you to the prestigious neighborhood of the most sought after community in the area. Choose from a variety of homes for sale in 19 individual and unique villages at Lansbrook. The subdivisions are Aylesford, Berisford, Carlyle, Devonshire, Ellinwood, Fallbrook, Golfside, Highgate, Ivy Ridge, Juniper Bay, Kylemont, Lynnwood, Myrtle Point, Northfield of Tarpon Springs, Oakmont, Preserve, Presidents Landing, Quail Lake, and Robinwood. Lansbrook covers roughly 2500 acres of golf course community with beautiful subdivisions, parks and walking trails. At Lansbrook, homeowners also have access to boating and fishing on Lake Tarpon from their own private park. Depending on which of the spectacular subdivisions you choose in Lansbrook you will find single family homes ranging in price from moderate to luxury price ranges. Whether your favor is golfing, fishing, boating, or just relaxing in the views, we offer it all. Other amenities found throughout Lansbrook communities are picnic areas, walking trails, pavilions, and playgrounds. These communities fashion high quality homes with extraordinary custom features such as gourmet center island kitchens, oversized rooms, heated swimming pools, soaring ceilings, open floor plans, ceramic tile and marble bathrooms with garden tubs, and so much more to list. Enjoy the peace and tranquility you deserve living in here! Nearby there is access to all the area's entertainment, casual and fine dining, plenty of shopping, exercise at the local YMCA, and biking or walking on the nearby Pinellas Trail. You can easily visit local county parks for picnics and recreation with lake access. As if all this is not enough, a twenty minute drive brings you to the most beautiful white sandy beaches on the west coast of Florida. Selling your Home in Lansbrook? Are you considering selling your home in Lansbrook? Look no further than Lipply Real Estate. We will help you every step of the way in your home selling process. We are confident we can help you receive the best possible sale. Call our agents today directly at 727-314-1000 or enter your information in the form below.